If you're looking for a way to restore the pride in your Toyota, you'll love our automotive detailing at Eddy's Toyota. Now at Eddy's Toyota of Wichita, you can take advantage of our premium detail package for just $29.95 when you redeem this coupon. We'll renew your vehicle with careful hand wash and chamois dry, tire and wheel cleaning, interior vacuuming and wipe down, cup holders and console cleaning, window and mirror cleaning, tire dressing, and door jams wiped down. With our premium detail service, you'll get your vehicle back quickly and feeling like new. 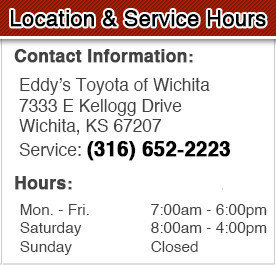 Save big on the refreshing feeling of a clean vehicle with our express detail service at Eddy's Toyota of Wichita.